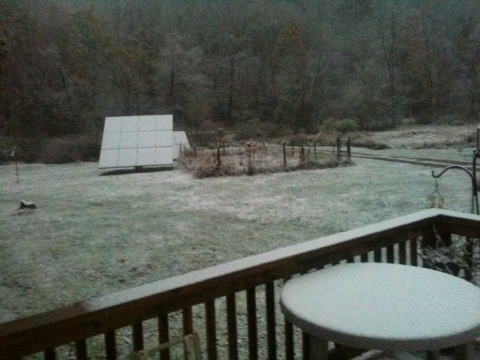 It is still dark but we got our first dusting last night. Well I think we have finally decided on a name for our unexpected rooster. I thought you all came up with some really unique ones. I thought Victor/Victoria and Sultan fit his situation well. I rolled Sultan around my head for days, because after all, he does have a harem of hens. Thanks to all who put out ideas for us to ponder. My sister thought he needed a pirate name and since he has sleek black feathers we thought maybe Black Beard, but that didn’t suit him. I saw him gallantly bow down to one of the hens yesterday and then swaggered off after he got what he wanted. I could just imagine a red bandana around his head and some beads strung in his feathers. Sonny and I decided that this rooster and all future roosters will have the surname Roo. So in honor of Captain Jack Sparrow who he resembles, he will be called Captain Jack Roo. It suits him well. I am sure Sonny can teach him some bawdy sailor slang and International Talk Like a Pirate Day which is September 19th, will be a holiday on Pot Hole Farm. Oh, wait a minute…it already is. Arrrrgh me mateys! Tis a fine day to be alive. Thanks everyone. The day’s weather has been cold, grey and gusty. 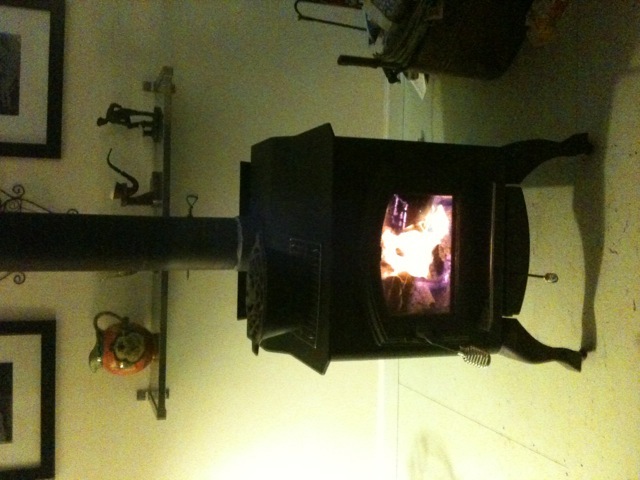 The perfect kind of day to build a fire in the wood stove for the first time this fall season. Oooooo, toasty. Breaking in the new stove. THE WEEK IN REVIEW CONT. We were excited to see my family when they arrived. The usual greetings and long missed hugs and kisses were given out, then the truck had to be unloaded. There were suitcases of clothes for all types of weather, coolers, gifts, and favorite sleeping pillows that couldn’t be left behind. My father’s 2005 red chevy truck was parked away from the black walnut tree that has been dropping huge round nuts from its naked limbs. Anybody who knows my father can tell you how much he loves and babies his truck. It is in pristine shape and the inside is spotless. When the door is opened you expect the smell of a new vehicle to still linger there. The fire red paint and shiny chrome still sparkle and dazzle the eyes. If it had a personality I would expect it to crinkle its grill in disgust at having to sit beside the Dirt Mobile. If a strong breeze should blow some dirt might accidentally puff over in it’s direction. The next morning as we all went out to investigate the farm and let the chickens out we noticed that the driver’s side front tire was flat on my father’s truck. They were the original tires and believe it or not were still in good shape. Just not in shape enough to handle the stones and pot holes of our road even though it drove through them very slowly. Not to worry, we can just change it out and put on the spare tire that is cranked up underneath the truck bed. NOT! My father was flustered and came into the house fuming because he could not find the jack and crank. My sister and I figured out how to pull the back seat up and found the jack. Only the jack. We searched the truck over trying to figure out where the crank to let the spare tire down could be located. Unfortunately my father had taken out the owners manual at home to look something up and forgot to put it back in the truck, so we couldn’t use it as a reference. He was fit to be tied as anyone would be in a situation such as this. Its not like we are just down the street from a Chevy dealer and without the right tools you can’t get to the spare tire. Both Sonny and John were out of town and unavailable to help figure out another option at this point. Remember this truck is my father’s pride and joy and a flat tire that can’t be fixed immediately is unsatisfactory. Thank goodness it happened here at the house and not the on the road. I called the Chevy dealership in town and to see if they could tell us where the crank was located. We found out that it should have been in a bag and strapped down next to the jack. Uh oh…. The conclusion was that it was never put in the truck when it was new. My dad would never have removed it. Heck, he never had a flat tire before in this vehicle. Ok, so there was no crank. What to do now. I asked the parts guy if they had any cranks available for this model of truck and how much they would cost. My dad just about fell out of his seat when I told him how much it would cost for the tool. $130.00. The parts man said he could order one if we wanted and have it sent overnight. They didn’t have any available, but the GMC dealer next door should have them. Sounded odd to me, but I was ready to try anything. So we went to town and went into the parts department of the GMC dealer to see if we could get the parts for the crank. No can do, said the parts man. He would need the vin number of my dad’s truck to get the correct part and the ones he had were not available. They were ordered for another customer, but if we called him with the vin number, he could order the part and it would arrive in five days. Not good. My parents had to be back in Delaware for an appointment before then and my sister had to go back to work. Plan B: Go over to the Chevy dealer and just see if something could be done. “Yes” says the manager of the parts department. He checked the stock on the computer and found what we needed. Not sure why it didn’t show up before. So with $130.00 lighter in the pocket, we happily leave with the tool. Got home, tried the crank and found out it didn’t fit. Black clouds gathered around my father’s head. Think quick! What can we do before he blows his top? Too late, nothing could be done until John and Sonny got back. Well, they never did get the spare tire down. They ended up going to Sam’s and bought a new one. Sonny talked to the manager at the Chevy parts department and they are going to send my parents a check for the returned crank. All ended well. Monday morning the back of the truck was packed again and after good bye hugs and kisses all around the doors of the shiny red truck were shut. Sad faces peered out and hands waved good bye, but the truck didn’t go anywhere. It wouldn’t start. Harold gave it a jump start from his car and off it went down the pot hole road. Talked to my parents today. Dad has already taken the truck to get a new battery and check up. I guess it was time for a new one. All the fluids are changed regularly and they were ok. The next stop was Sam’s for a new set of tires. I’m sure it was taken to the car wash too for a good bath. I have no doubt that tonight the moon’s light will reflect off the shiny fire red paint and chrome. It’s safe at home now and I’m sure if we all listened real close, we might hear a long sigh of relief. We have spent a wonderful week here at Pot Hole Farm with my family. My parents and my sister came from Delaware for a visit. Harold and Clarissa arrived on Friday after work. The air mattresses and extra chairs were pulled out of storage as well as the spare coffee percolators. You have to have the rousing aroma of coffee wafting through the house to get this crowd moving in the morning. Duke was introduced to his great grand parents and great aunt from my side of the family. We’re a loud bunch when we get together and you better be able to take a lot of teasing. If you need some laughter therapy just come on over. Yesterday Sonny, Harold and Clarissa got a good bit of wood cut and stacked. They worked in the front pasture clearing some of the fallen trees and brush hogged the overgrowth. It looks much better. While they were hard at work Duke kept us old ladies entertained. My Dad swept and put the porch in order (a job I have been meaning to get around to) and supervised the wood collection. 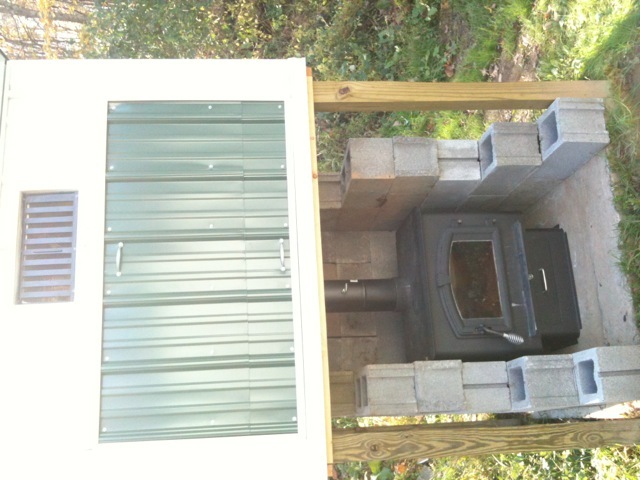 The meat smoker project is finally finished and tested. Saturday Sonny and Harold and John connected up the wood stove and used the left over concrete blocks from the root cellar project to make a wind break. They fired it up and tested it to see if they could get the smoke chamber up to the required temperature for smoking the hams. We’ll smoke the hams in another couple of weeks. Ready to smoke the hams. Last night John and Carol joined us around the stone fire pit. It was just cool enough to be able to cozy up to a warm and bright camp fire. We all savored the flavors of Pot Hole Farm coffee, with a slice of homemade pumpkin or chocolate pie. It was memorable evening to end a week of great fun. Tomorrow I will tell you all about the first day my family arrived and the story of the flat tire that could have frustrated even Ghandi to the point of a few choice words. Life is good! 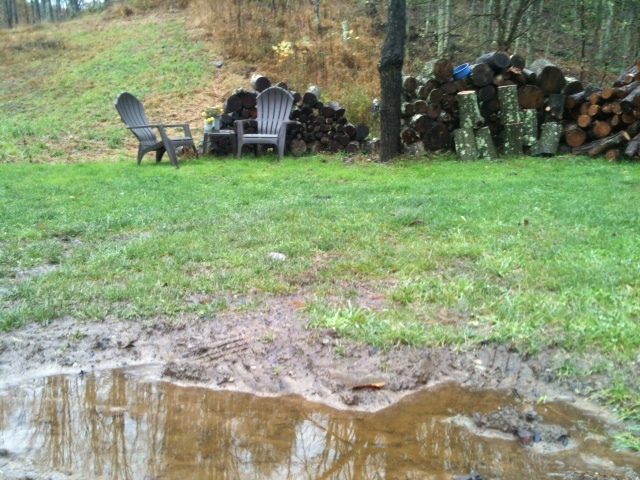 You are currently browsing the Off-Grid in West Virginia blog archives for October, 2011.